Bulletproof Upgraded Whey Protein is a minimally processed nutritious supplement derived from grass-fed cows not treated with hormones. 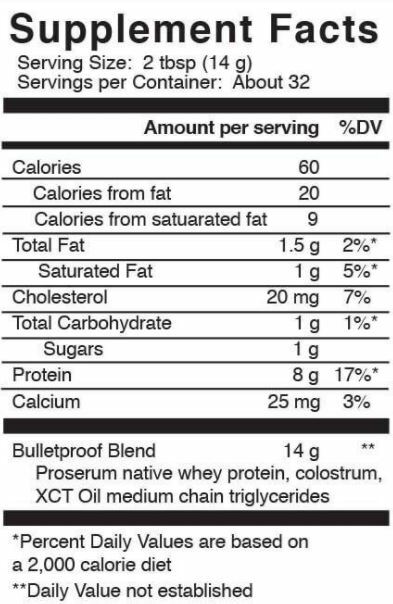 The addition of Bulletproof XCT oil powder (MCTs) along with Colostrum, makes this blend unique. Mix 2 tablespoon in 120ml of water or other liquids (i.e. juice), once per day. Take a few hours before or after taking other medication. For prolonged use, consult a health care practitioner.